In Downtown San Diego, the buildings sometimes have an interesting history. Which building used to be a famous brothel? Which used to be an opium den? Which was a favorite hang out of Wyatt Earp? And which was the city morgue? Read on to learn more about the often rich history of our downtown area. As the San Diego community grew in the new state of California, a government surveyor Andrew Gray (1820-1862) recognized that the best place for a seaport city was on the bay, the site of today's downtown. William Heath Davis (1822-1909) of San Francisco agreed. For $2,304 Davis and three other businessmen purchased 160 acres of waterfront land, up to what is now Front and Broadway. He named it "New Town". They laid out 56 blocks, and dedicated Pantoja Plaza, the first park, as the center of New Town. Pantoja Plaza remains today, as the center of much activity in the Marina District, surrounded by condos such as Park Row, Marina Park, The Watermark and Columbia Place. Davis purchased 14 prefabricated houses, built in New England, then constructed a wharf and warehouse in preparation of the anticipated residents and shipping opportunities. Unfortunately, and economic depression followed. While events of his day did not permit Davis to achieve his dream, his ideas were a premonition as to what would occur in years to come. Of the 14 houses, one still exists (pictured to the right), at the corner of Fourth and Island. 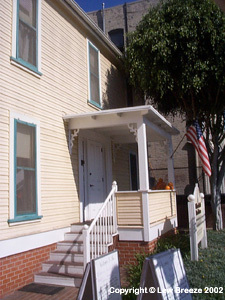 Now operated as a museum by the Gaslamp Quarter Historical Foundation, it is the oldest house still standing downtown. Alonzo Erastus Horton (1813-1909) purchased 960 acres of New Town within one month of arriving in San Diego. He paid a total of $264 (27.5 cents per acre). He created a grid of streets with small blocks and without alleys, allowing for a larger number of (more valuable) corner lots to be sold. The first real estate boom was under way. The price of downtown lots doubled and tripled over and over. New Town was established as the physical, social and economic hub of San Diego. Horton House, built where the U.S. Grant Hotel is now located, was one of the finest hotels of the day. In addition to being president of the first Bank of San Diego, he also donated land for a small town square that became Horton Plaza Park. San Diegos first electric street lights were installed downtown in 1886, and trolley lines began operating in 1888 over 37 miles of track. Elegant office buildings dotted Fifth Avenue where the regions business occurred during the day. South of Market Street, however, several blocks of bawdy houses, gin joints, gambling halls and opium dens, known as the Stingaree district, provided the night life. The area today is part of the historic Gaslamp Quarter. The Chinese community began downtown during this period with the building of the railroad. The sights and sounds of China became evident on the streets off Fifth Avenue as Cantonese merchants opened shops. Ah Quin (1848-1914) came here to serve as a labor broker for the California Southern Railroad. Quin was a man respected by all, a highly successful entrepreneur, a community leader and patriarch, who bridged Chinese and American cultures. Despite living in the Stingaree, he aided other Chinese in finding work and also improved living conditions. Known affectionately as the Mayor of Chinatown, Quins success in assimilating Asians into American life is ironically evidenced by the lack of a significant Chinatown in San Diego today. Wyatt Earp (1848-1929) arrived in San Diego after his Tombstone days. He invested heavily from 1885 to 1887, in the Stingaree district real estate and saloons. Earp owned or leased four saloons and gambling halls; the most famous was the Oyster Bar, located in the Louis Bank Building on Fifth Avenue. Speaking of Wyatt Earp, there is (or was, I'll have to revisit) an interesting shop at 413 Market called "Wyatt Earp Museum, Books, & Collectables". Doc Holliday the man, did not live here as far as I know. But my dog is named "Doc Holliday", if you want to see photos of him and local pets, visit his website here. The late 1890s ushered in a difficult period for San Diego. The citys struggling economy owed much of the following recovery to a wealthy businessman named John D. Spreckels. He came to downtown in 1887 for a visit from his home in San Francisco. He made his visit permanent. In downtown, Spreckels was responsible for a great deal of growth. At one time, he owned most of the acreage south of Broadway. He purchased the streetcar system and changed it from horse-power to electricity. He also bought the San Diego Union and The Tribune newspapers. San Diegos cultural life benefited from his accomplishments, as well, including the building of the landmark Spreckels Theatre (the first modern commercial playhouse west of the Mississippi). He also built the San Diego Union Building, the Hotel San Diego and the Bank of America Building at Sixth and Broadway. Built in 1927, that was the last downtown building of any significant size built until the 1970s when the current redevelopment program began. Also during this period, George Marston was busy focusing on ways to improve life and provide opportunities for residents living in the growing community. Marston had clerked for storekeeper Joseph Hash for five years before he and partner Charles Hamilton bought the business for $10,000. Marstons ultimately became San Diegos premier department store. An advocate for urban growth and development, he was the founder of the San Diego Historical Society, and established both Presidio Park and the Anza-Borrego Desert State Park. In 1902, Marston put up $10,000 to allow the citys park commission to hire Samuel Parsons, landscape architect for the City of New York, to prepare the first comprehensive plan for Balboa Park. In Marston's vision, Cedar Street was to be a grand boulevard, lined with stately government buildings from the waterfront to Balboa Park. The County Administration Building was the only building constructed. The later construction of I-5 cut through downtown, shutting off any future opportunity to achieve this plan. The Panama-California Exposition of 1915 and the California-Pacific Exposition of the early 1930s, along with national tragedies posed by the Depression and First and Second World Wars, all had much to do with shaping downtown San Diego between 1900 and 1950. I hope you have enjoyed this look into our history. As I continue to walk around downtown, if I find more buildings with colorful histories, I'll be sure to snap the photos and add them to this page. On another note, real estate is my business. Whether it's buying, selling, or just a question, please stay in touch.If you have any friends or family thinking about living or investing in Downtown, please give them my name, phone number, email, or web site address, www.sdcondo.com.